I will always remember my college graduation day. Not because it marked years of hard work, accomplishment, or the beginning of a new chapter, but because it was Cinco de Mayo. Following commencement, I had both Virginia friends and friends who had driven up from Georgia (on a whim as a surprise) come together for a big Cinco de Mayo graduation fiesta. It was actually dubbed “Cinco de Kelley” – and yes, I know the translation makes zero sense haha. 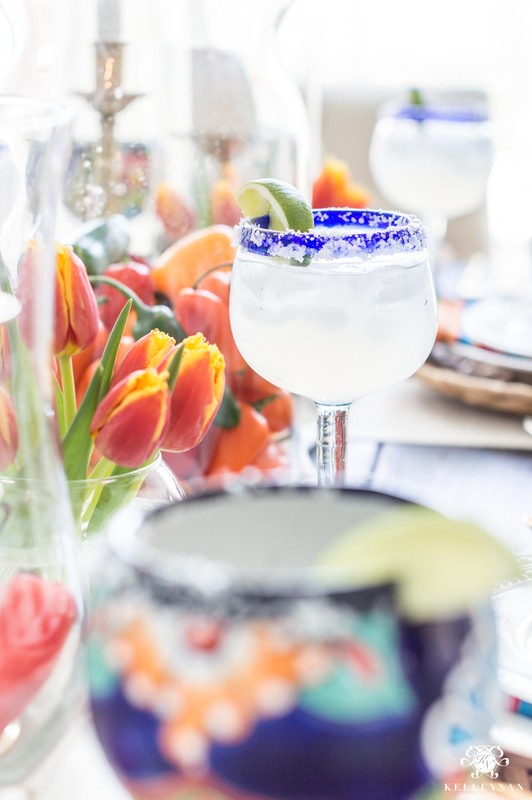 It was one of my most favorite days, with my favorite people, with my favorite food… since then, each Cinco de Mayo, we always reminisce on that sweet, festive celebration my mom pulled together on my behalf. Fast forward several years later… with my love of everything Mexican combined with Dave’s hometown of San Antonio, if holidays were spirit animals, Cinco de Mayo would be ours. 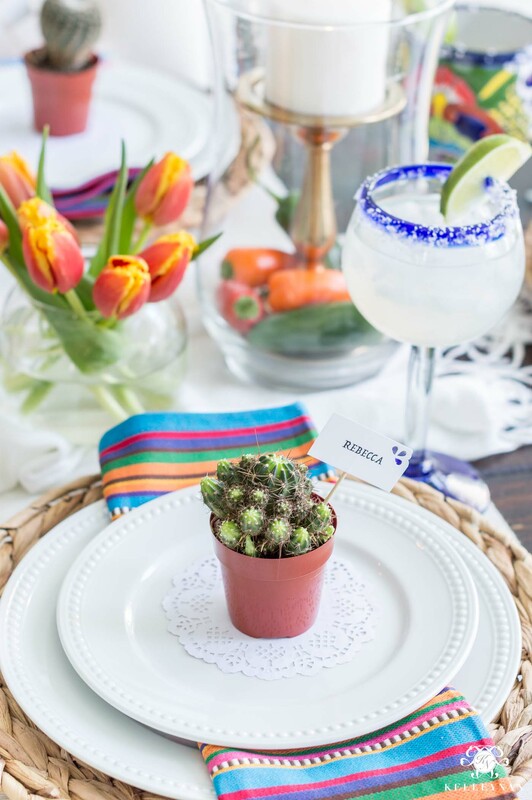 This year, I wanted to pull together a celebration that combined elements from that favorite day in May from my twenties with all the sights and sounds we experienced at Fiesta last year (you can see that full post HERE). 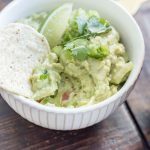 As a bonus, along with all the Cinco de Mayo dinner party fiesta ideas, I’ll be sharing Dave’s famous (seriously), authentic guacamole recipe at the bottom of the post. 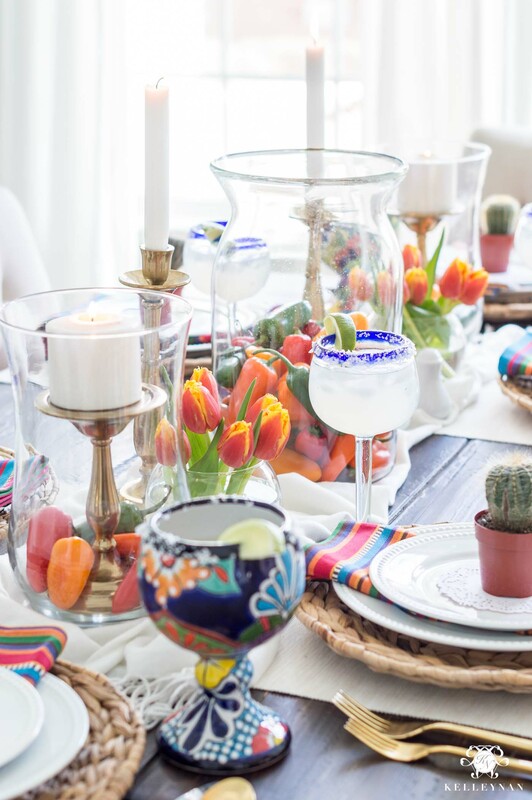 Whether you are planning a full graduation sized soiree or are hosting an intimate dinner, hopefully you’ll finish this post with all kinds of ideas – from food to decorations – to host the most festive Mexican fiesta ever. Don’t overthink this one. Unless you have a bartender with access to a full bar, all you need are the basics. 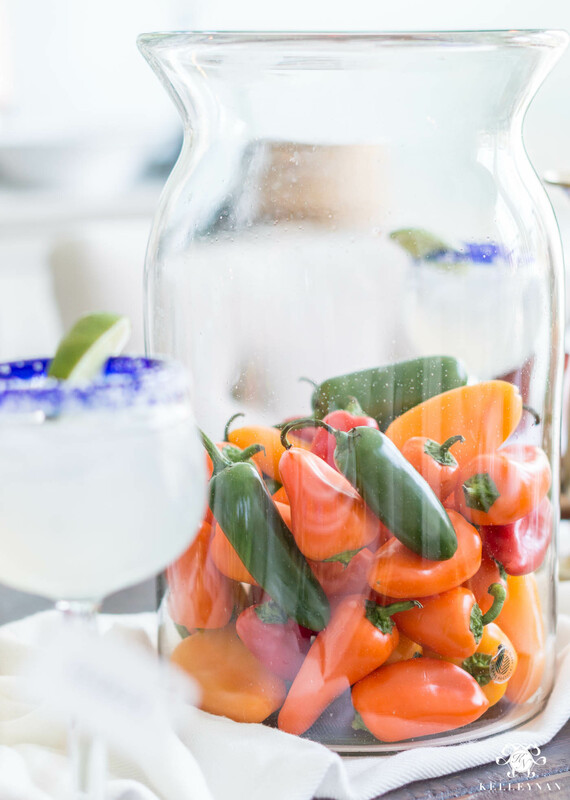 Stick to your favorite margarita recipe; and determine ahead of time that they will all be served on the rocks. Frozen is fun but you will stay glued to the blender if you decide to offer options. If they will all be poured over ice, you can prepare a big batch ahead of time and store in the refrigerator. Then, you can fill your pitcher(s) as needed; you can even store several carafes (like THESE) in the fridge and let those serve as your pitchers. 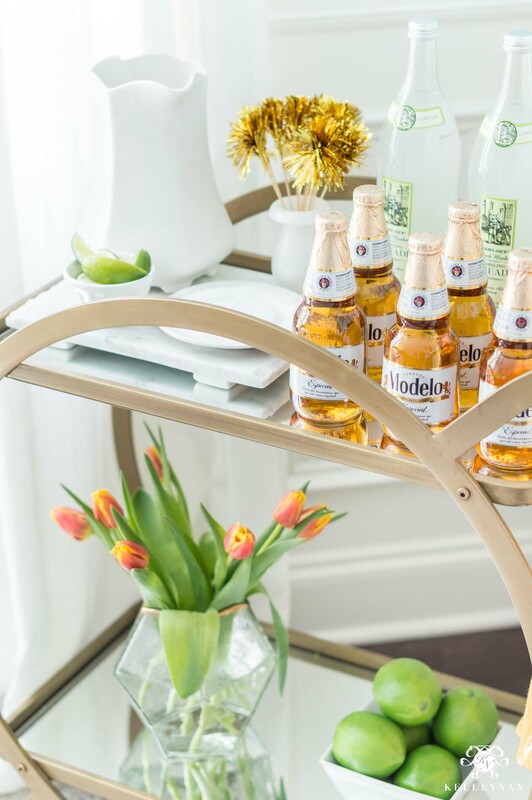 You don’t have to provide a variety of beer and wine, especially for your Mexican themed party. 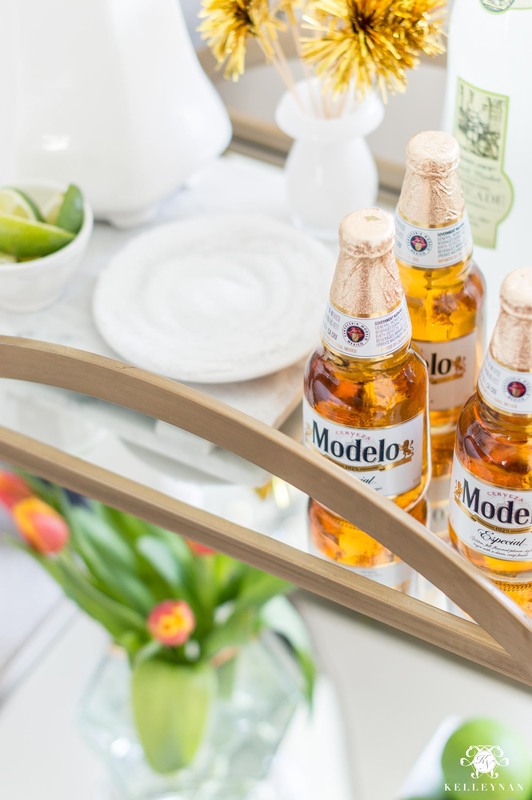 Stick to your signature drink along with Mexican cerveza. For those who don’t drink, have pitchers/bottles of limeade on hand so they can get in on the festive celebration with virgin margaritas. 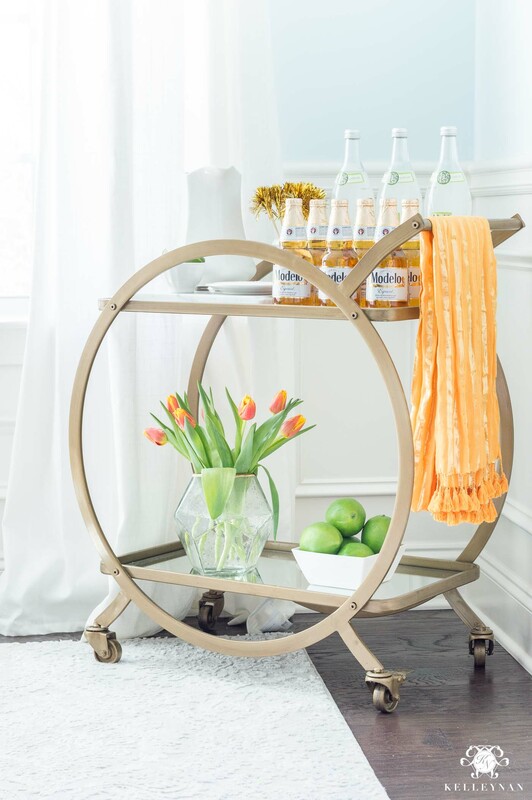 Let your citrus serve as your bar cart decor and have a LOT of limes on hand – these will be used in margaritas, beer, and in lining the rims in preparation of salt. For presentation, I like to pour margarita salt on a small bread plate. It will also keep your unused margarita salt fresh in the original package. Lastly, I took full advantage of throwing a colorful party by hitting my closet and sifting through scarves and fabric. I found the most fun, golden tasseled scarf; I don’t know where it came from or how long I’ve had it (or if it’s ever been worn) but I think it was made for this Cinco de Mayo fiesta. When we were flying home from Texas last year, the one piece of Mexican pottery I brought back busted. I suppose I’ve moved past that heartbreak but lucky for me, my mom has a ton. 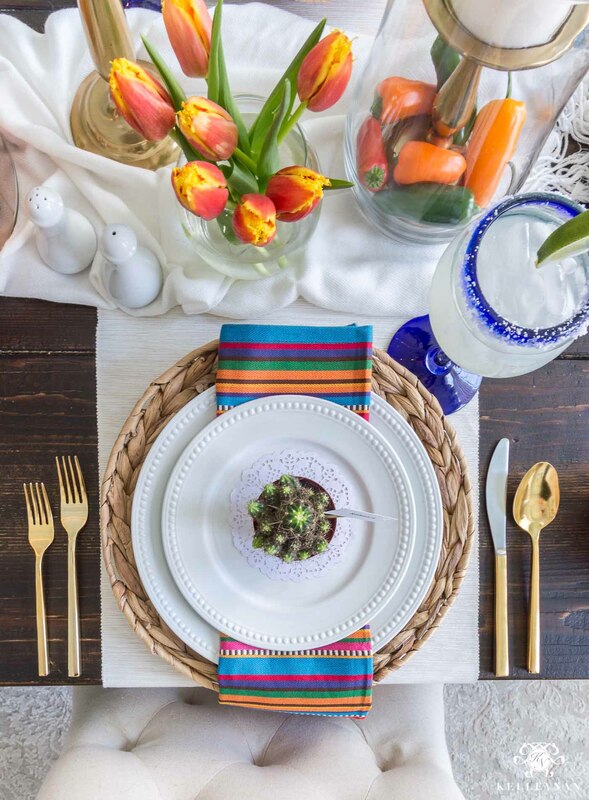 When I was visiting with her a couple months ago, we had the foresight to pull some pieces that I envisioned at my fiesta dinner party. I lucked out and scored some colorful napkins on clearance during my trip too, which were the initial inspiration for the entire table. 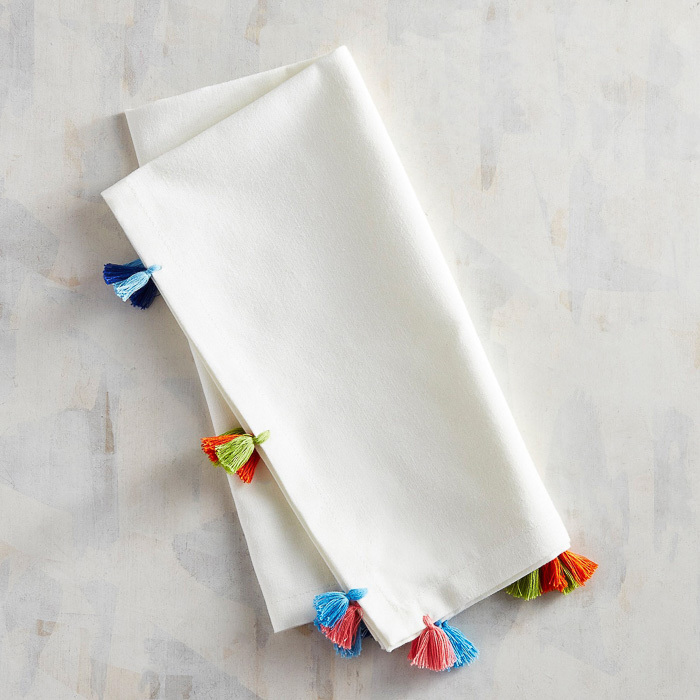 Unfortunately, they are no longer available but I LOVE these adorable napkins– instead of big bold color, they have sweet little colorful tassel details. 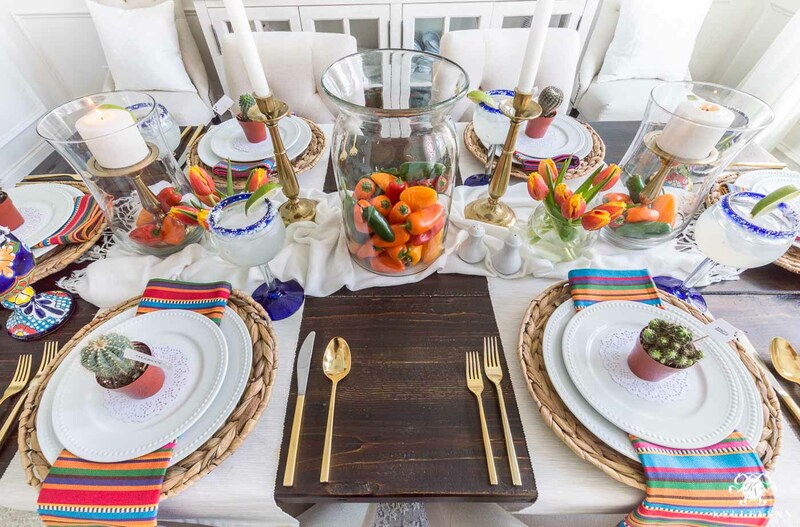 I used hand blown glass Mexican glass goblets on the side place settings (SIMILAR) and Mexican pottery goblets at each end (SIMILAR). 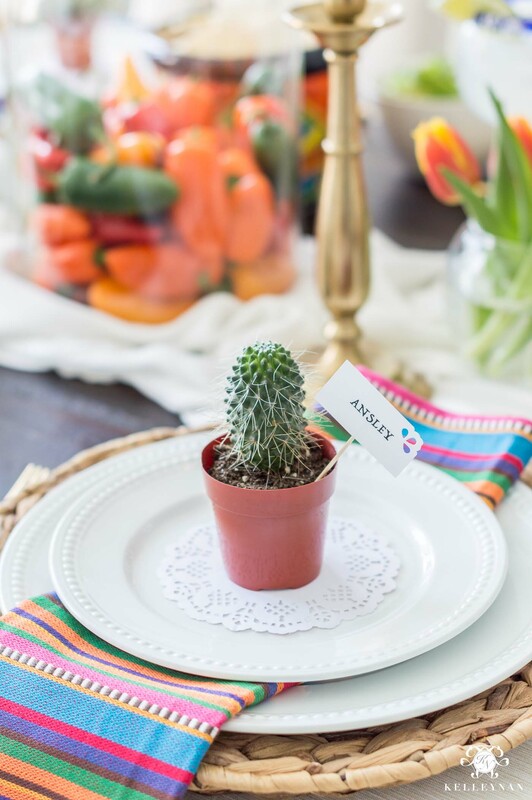 I found mini cacti at Home Depot for party favors and place setting markers; I printed little name cards, taped them to toothpicks, and punched a corner lace detail. 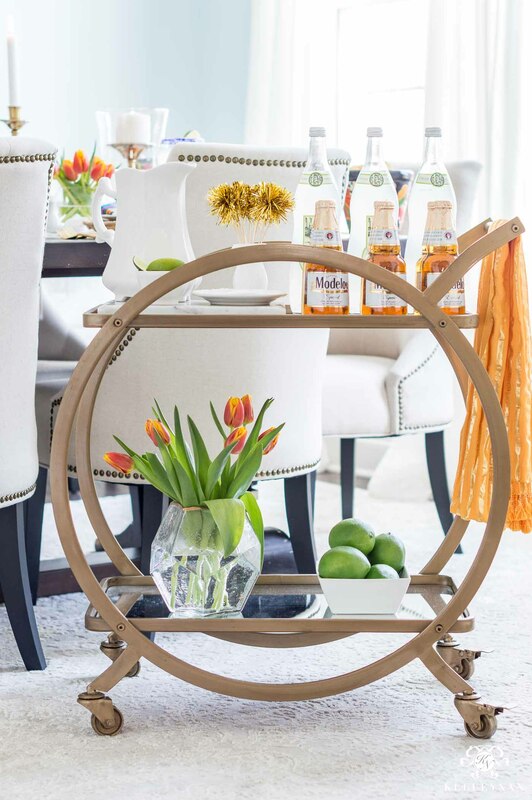 Even if you aren’t hosting a dinner party, you can get several to set up as favors for guests. Along with the arsenal of pieces I borrowed from my mom, I resorted to resourcefulness around my own house. 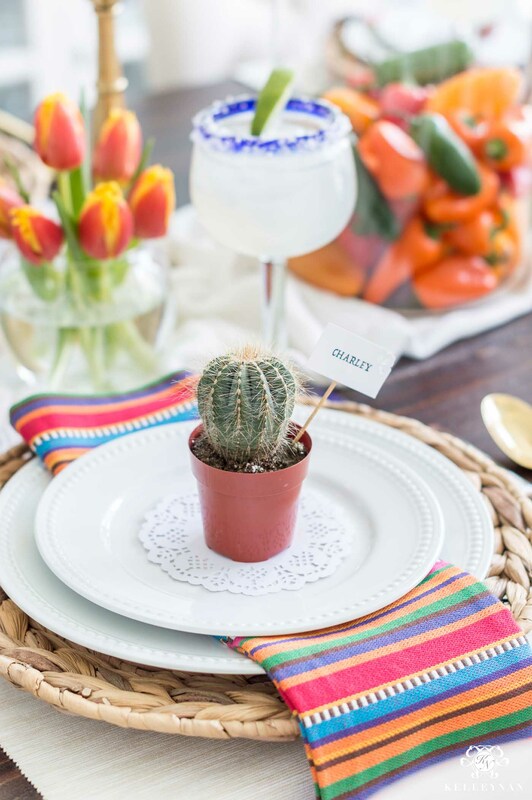 I added a tasseled pashmina as a table runner (also a find from my closet) and flipped pink polka dot doilies upside down at each place setting – I thought they were reminiscent of little Mexican banners. 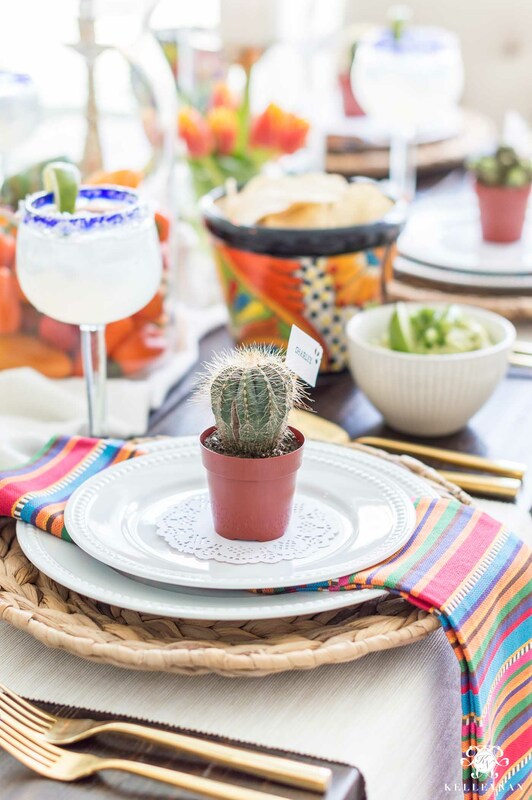 I made an effort to think outside the box, too – one of the mini Mexican pottery pieces I borrowed was a small garden pot. 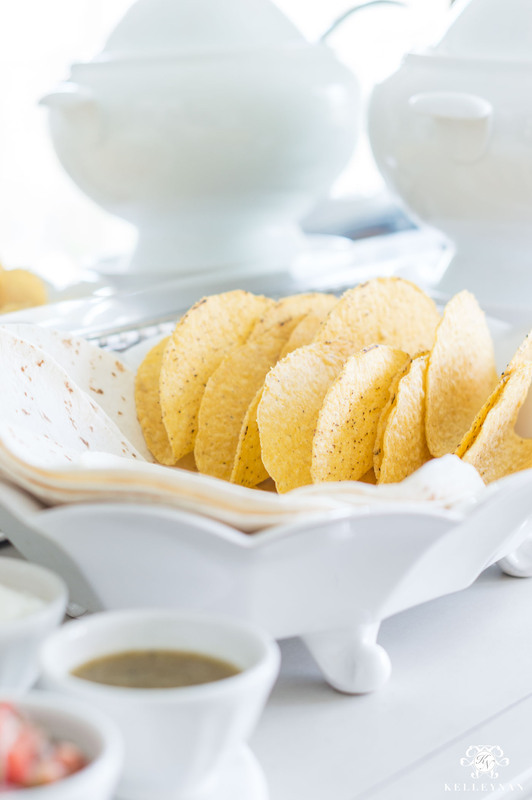 I lined it with paper towels at the bottom and used it as a chip bowl for the table. You can find a similar one HERE. 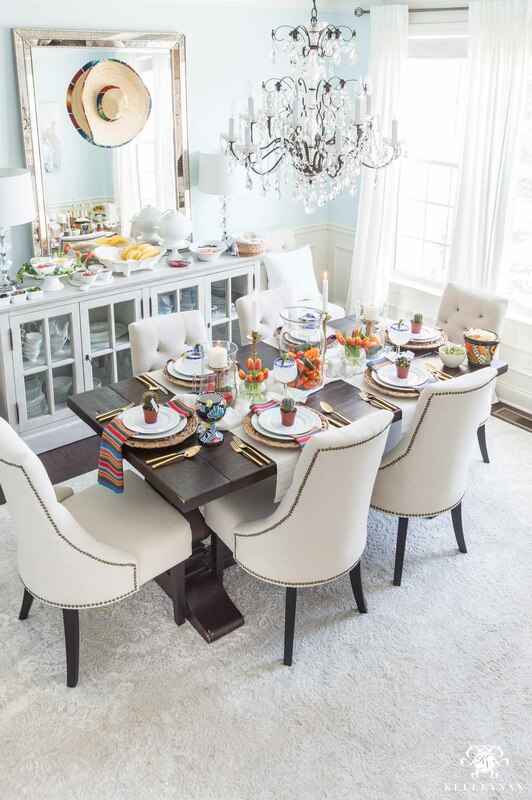 With so much vibrant color, I kept the dinnerware and runners as neutral as possible. 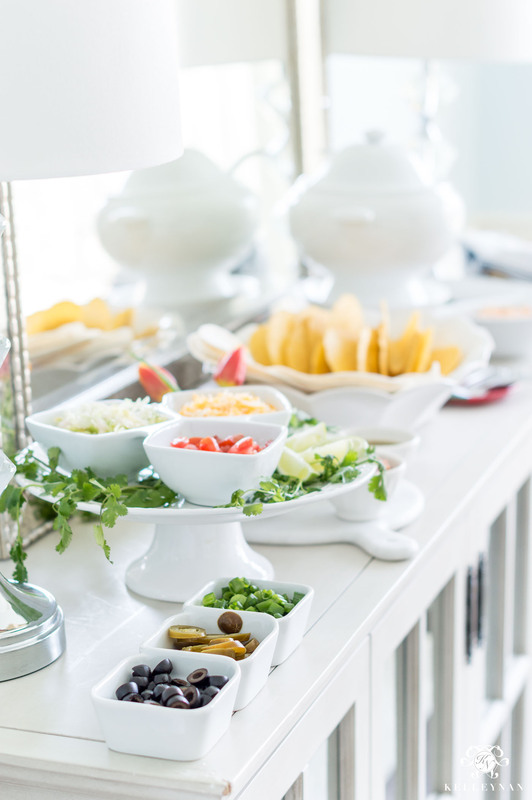 My mom hosted Cinco de Kelley with a full taco bar – it was fun, easy to batch, and perfect. The key to a good taco bar is to provide variety. A LOT of variety. 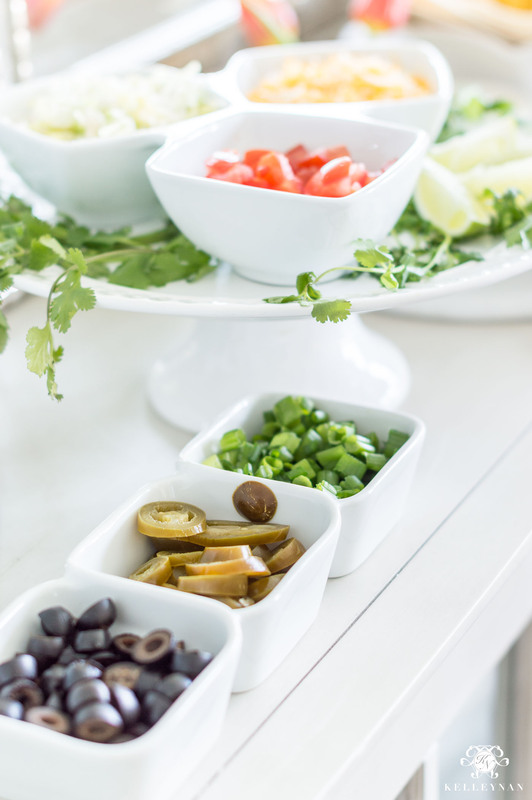 It’s a relatively inexpensive way to feed several people so splurge a little and display all the toppings. Have both beef and chicken available. 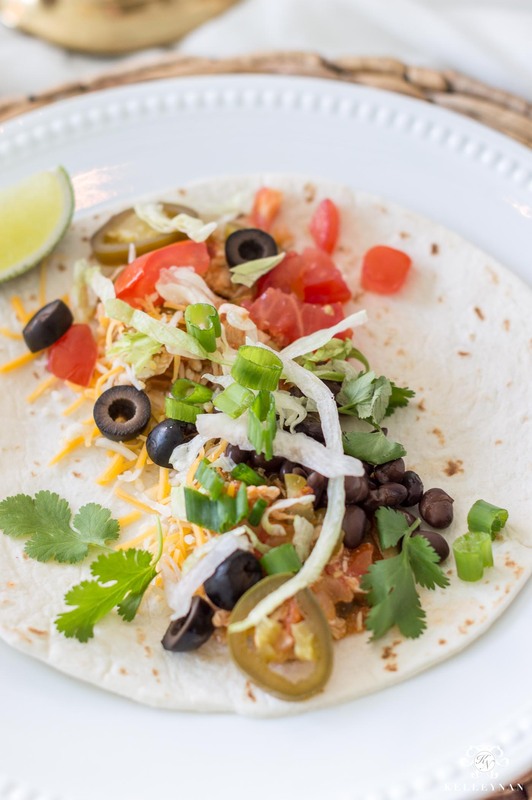 The chicken mixture can be prepared the day before; you can even use the recipe I use for my chicken tortilla soup (HERE); seriously – it’s simple and delish. Halve the avocados and scoop into a medium sized mixing bowl. Set pits aside. 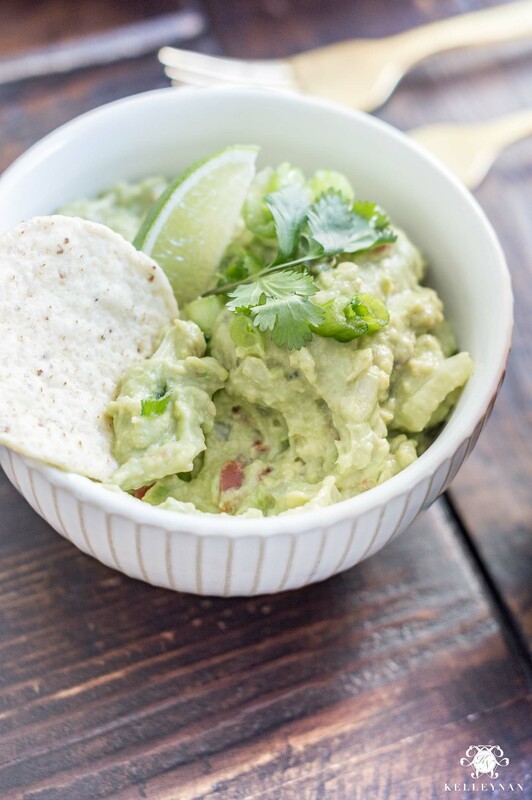 Using a potato masher, mash avocados until most chunks are gone. Add sour cream, tomatoes, onion, and the pepper, and stir. Add juice from 1/2 a lime. Add garlic powder and salt. Don't overdo it; add gradually until taste preference is achieved. Add the pits to the guacamole mixture, stir well, garnish with green onion (optional) and serve with chips. The pits help the guacamole from turning brown. 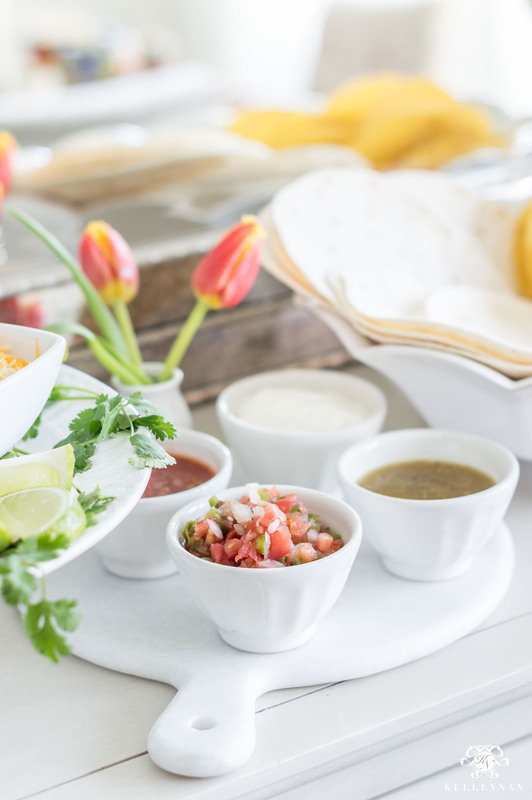 *Optional Preparation* If you prefer, you can toss tomato and pepper in a food processor for a thinner consistency before adding to guacamole. *You can add cilantro, if preferred. 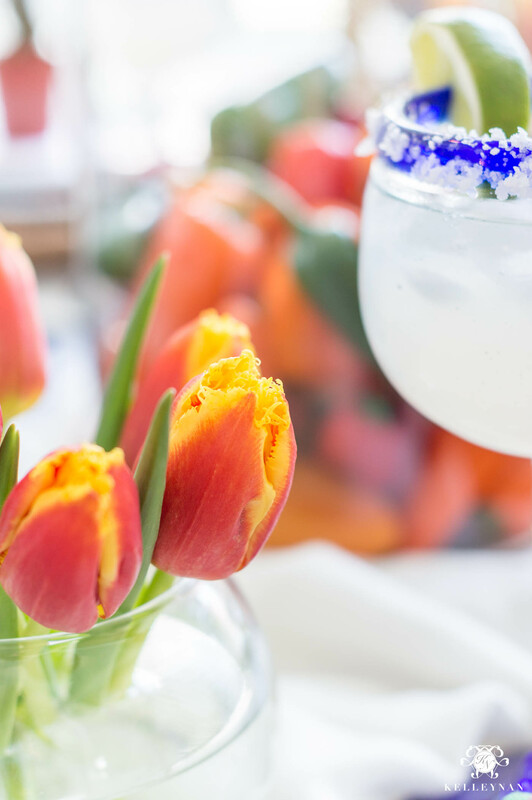 Whether you are prepping for Cinco de Mayo or have another Mexican fiesta party celebration on the horizon, I hope it is full of color, friends, and fun – cheers! 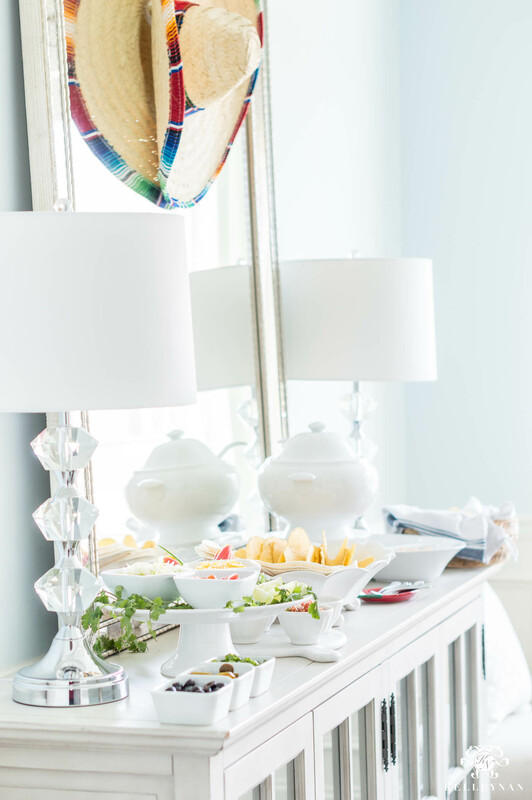 Subscribe to my emails below and never miss any of my entertaining and party ideas! Thanks for all the great ideas! 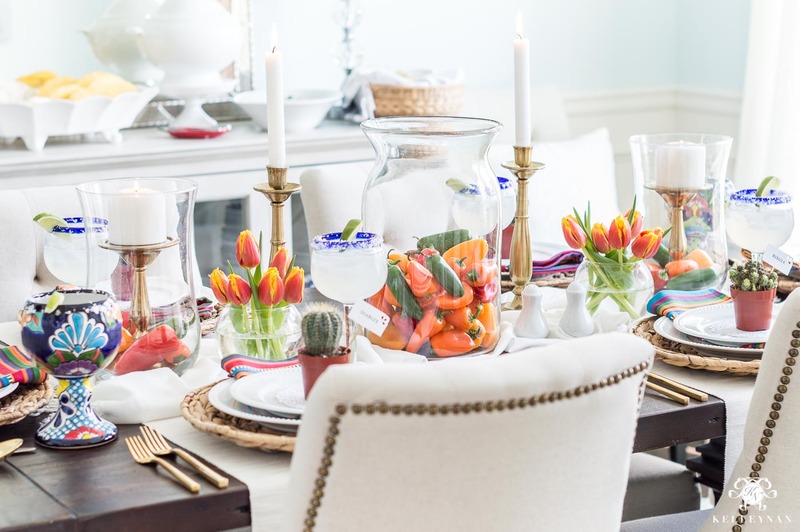 I would not have thought of using the multicolored peppers as decor! 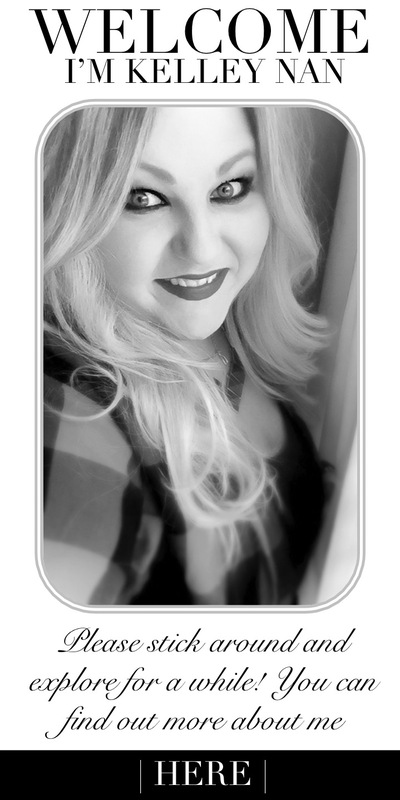 You know I am smiling big as I view this gorgeous and fun post. Cinco de Kelley wa such a special celebration. Fast forward to now and just look! I love every detail. The table is gorgeous! The pepper tulips are brilliant. 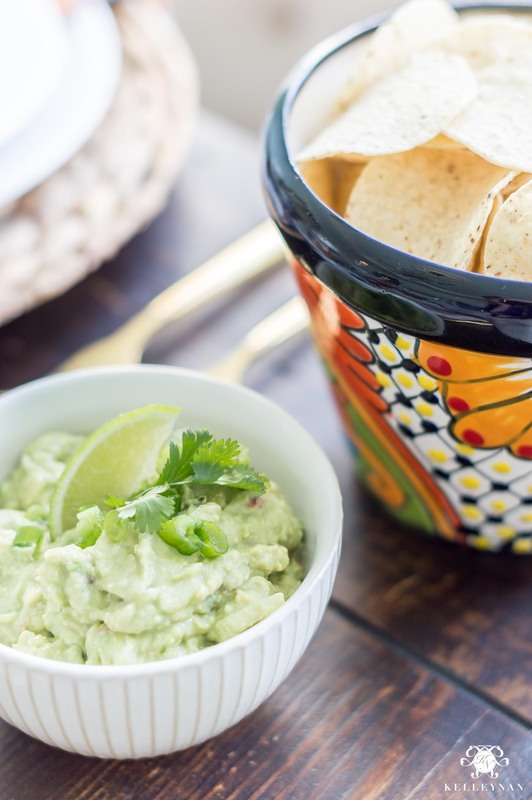 Plus, what a special gift from Dave in sharing his guacamole recipe. It is definitely the best! Kris, now. Leave that kitchen and come now. I love all the color and clever ideas! 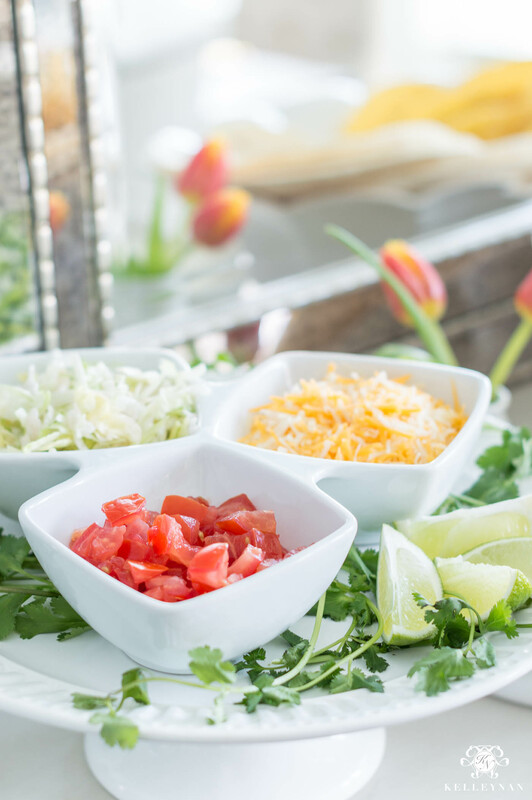 Taco bar = ME HUNGRY! Muchas Gracias for all the great tips! Oh, thank you! 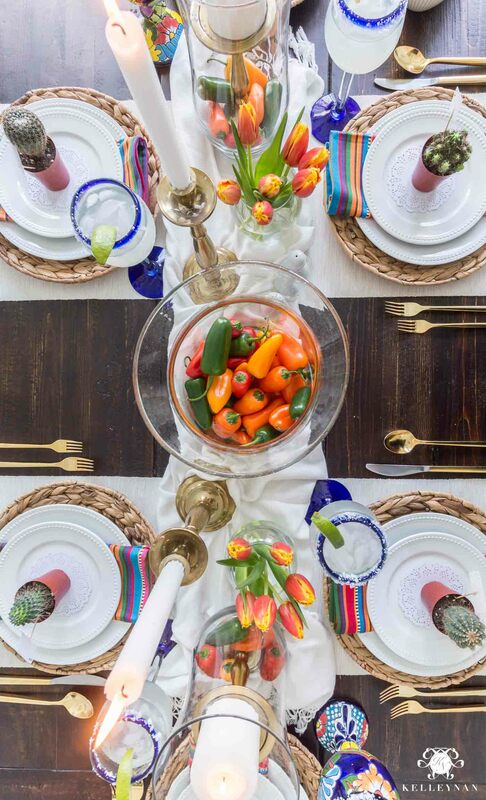 Wishing you a festive Cinco! I love this!! 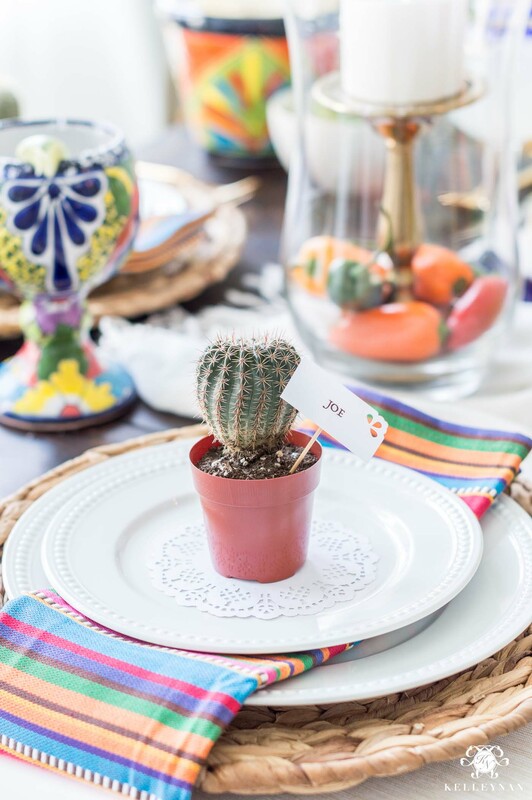 We are having a Fiesta themed couples shower for some friends this summer and you have given me so many great ideas! I just wish I could find those napkins, they are beautiful! Thanks Kelly! I’m definitely trying that!! Vivian, I’m so glad! Happy Cinco! 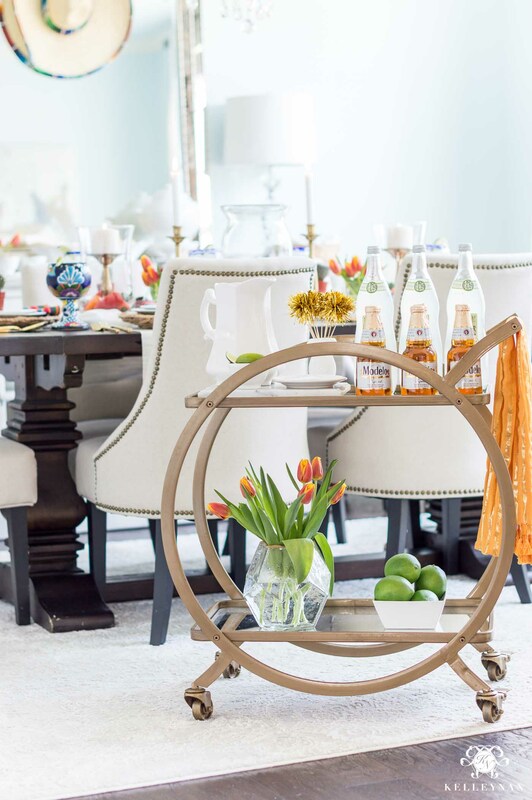 Oh my gosh Kelley this all looks so fab! 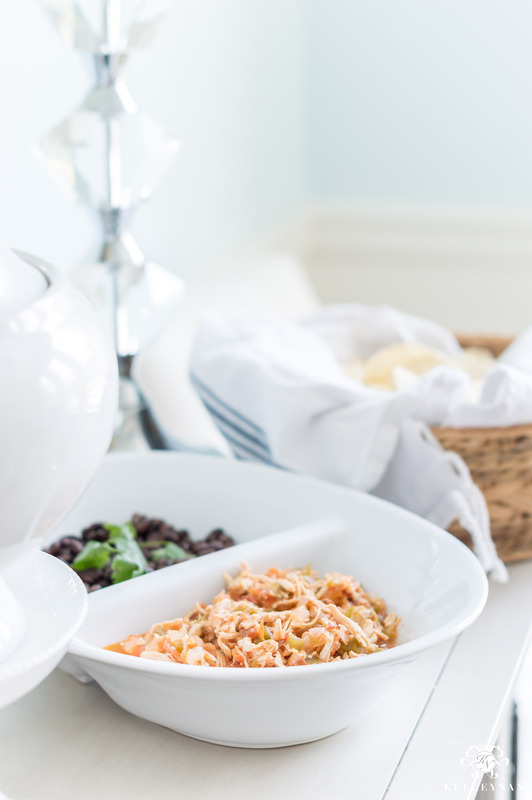 I love the napkins and the whole tablescape is gorgeous! The mini cactus are so cute!